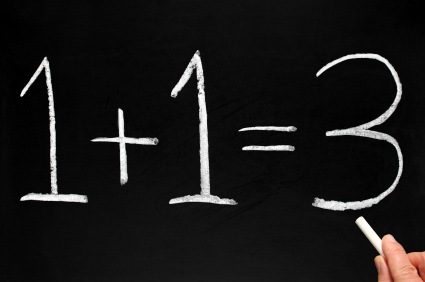 The media often feeds people misinformation about medical science. Leading the deception are the so-called skeptics who claim to be hard-headed scientists. One leading promoter of skeptic “science” is the physician Ben Goldacre. I took note of Ben Goldacre when he nominated meta-analysis as his Moment of Genius for the BBC. The BBC were asking people to describe their favorite turning point in the history of science. His choice might be described as Goldacre’s Error. One of the most egregious recent mistakes in medical science, meta-analysis is a sham way of presenting subjective information. Meta-analysis makes it possible to select the available data and get the answer you want. Selecting data is one of the biggest errors a scientist can make. Let’s use Ben Goldacre’s book Bad Science to show how this works. I consider this book well named – it is very bad science indeed. Here is an example of how Goldacre misleads by selecting his data. He begins by giving a graph of increased life expectancy in the UK covering the previous century. He explains that “we are living longer, and vaccines are clearly not the only reason why.” Goldacre suggests “measles incidence dropped hugely over the preceding century, but you would have to work fairly hard to persuade yourself that vaccines had no impact on that.” Read on and I think you will find it easy, rather than hard, to decide that his claims are bunkum and his argument deceptive. We are supposed to believe that this chart suggests that the number of cases fell dramatically as a result of medicine introducing the measles vaccine. Then Goldacre extends his argument to include the MMR vaccine. It now looks as if the MMR vaccine polished off what little remained of this nasty disease. But Goldacre has again selected his data switching from mortality to cases and on to notifications. Where are the serious cases and deaths that might make vaccination worthwhile? 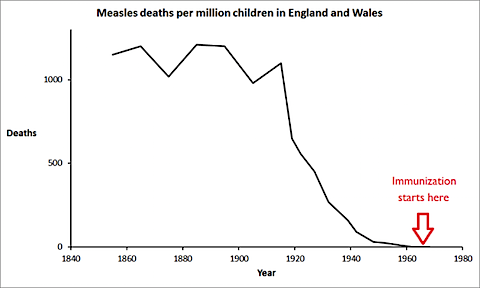 The counter argument is simple just look at this full chart of measles mortality from the UK and make up your own mind. Firstly, notice that the chart extends across the range of available data from the 1850s. Can you see the relative effect of vaccination? 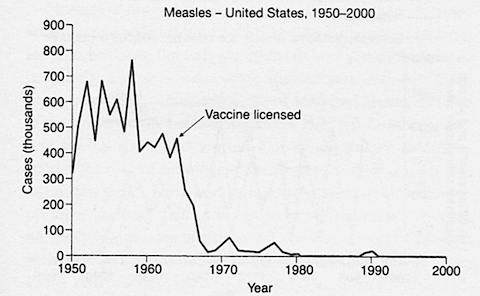 Basically, the deaths from measles had plummeted down to near zero long before vaccines were introduced. Improvements in nutrition and living conditions had almost completely prevented mortality from measles. Goldacre disregarded the massive reduction in deaths by selecting his data but he could not avoid acknowledging his sleight of hand. He stated that “there is absolutely no doubt that deaths from measles began to fall over the whole of the last century for all kinds of reasons” such as nutrition. (They had not just begun to fall – but had fallen to near zero before medicine introduced vaccination.) Is this a get-out-clause to avoid Goldacre being accused of selecting his data? 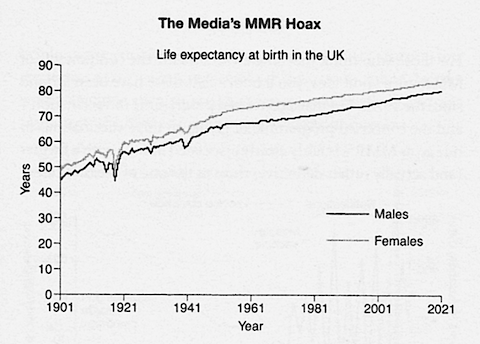 Goldacre also suggests that “the other thing you will hear a lot is that vaccines don’t make much difference anyway.” I suggest you look once again at the 1840-1980 mortality chart with the red arrow showing the start of vaccination and make your own mind up. My interpretation of the data is that vaccination and MMR made no appreciable difference to measles mortality. Nutrition and lifestyle had already beaten the disease and it is a stretch to suggest that MMR/vaccination had even a minor effect. The mopping up attributed to MMR/vaccination is more sparingly explained by nutrition and lifestyle – just a minor continuation of the earlier improvement (Ocham’s Razor). Pasteur had some impressive results with vaccination of sheep against anthrax but this was back in the 19th century. Unfortunately, medicine applied vaccination indiscriminately and abused the technology. Yes vaccination is a technology and it does not make sense for someone to be philosophically “for” or “against” vaccination. It depends on the application and implementation. If bitten by a rabid dog I would probably chose to be vaccinated. However, I find no benefit in the idea of being vaccinated against the risk of influenza, measles, mumps, and so on. With the widespread abuse of the technology and the unremitting propaganda, rational people may decide to avoid most and possibly all current offers of vaccination. 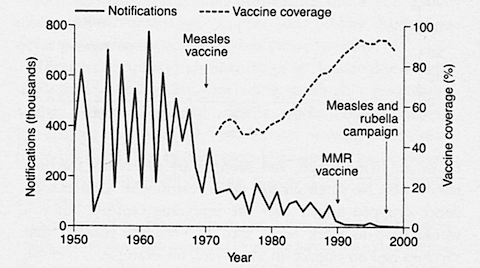 The decline of measles independent of both vaccination and mainstream medicine is not an isolated event. Deaths from other infectious diseases also dropped rapidly over the previous 150 years as a result of nutrition and lifestyle. Unfortunately, this improvement is not the case in all countries where pure water, good nutrition, and sanitation are needed. (Benefits arising from these basics will surely be wrongly attributed to vaccination.) Professor Thomas McKeown gave an account of the decline of infections in his book The Role of Medicine which was published back in 1979. The real information is widely available. It is wise to check Ben Goldacre’s claims because they can be misleading and Really Bad Science! Sunlight and vitamin D played an early role in preventing and treating TB. In the early 20th century, TB patients were often sent to sanatoria in the mountains where they were exposed to solar radiation. Dr. Auguste Rollier set up such facilities in the Swiss Alps. Sun exposure is associated with a lower incidence of TB six months later. . It wasn’t until 2006-7 that researchers at UCLA determined how sunlight increased vitamin D levels and helps the body’s immune system prevent bacterial infections . Higher blood levels of 25-hydroxyvitamin D can reduce the time required to control TB during treatment. [4,5] Recent research suggests the sanatoria approach to treatment could have been at least partly effective. 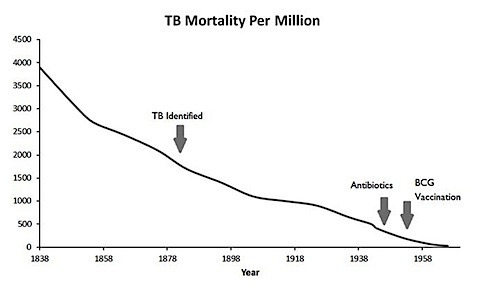 The question raised by this graph is what really caused the decline in death rates from TB and other infections. We can answer this easily and directly. Firstly, TB did not go away. There is a reasonable chance that a reader is harbouring the disease. Roughly one person in every three in the world (2-3 billion) has the infection. However, only 10-20 million have the active disease. So only one person in every 100 or so infected will have any symptoms. The rest will happily coexist with their “infection” without concern. Despite the data strongly suggesting the impact of nutrition, corporate medicine has consistently decried the use of supplements. Recently, however, there has been a long overdue development. Catherine Vilchèze and colleagues have returned to testing the extraordinary antibiotic properties of vitamin C for TB. They found that “M. tuberculosis is highly susceptible to killing by vitamin C”  which is consistent with previous data. Notably, the mechanism of action is similar to vitamin C’s anticancer role in generating hydrogen peroxide locally which kills the unwanted cells. Notably, we have been using antibiotic treatment of TB as a model for the role of vitamin C based redox therapy for cancer. The same mechanism is used to protect the body against both microorganisms and abnormal cancer cells. Vilcheze’s suggests that drugs with a similar mechanism of action to vitamin C might be developed (presumably with great commercial advantage). However, such drugs are an unnatural intervention, and are likely to have unnecessary side-effects while vitamin C is safe. The rather obvious implication of providing high-dose nutritional supplements is once again ignored. If supplementation were to be widely applied, our society may find controlling TB is unexpectedly easy. The recent history of antibiotics is one of misuse leading to microbial resistance. Following Multiple Drug Resistant TB (MDRTB) and eXtensively drug resistant forms (XDRTB) we are now faced with Totally Drug Resistant forms (TDRTB). The increasingly ineffective antibiotics have helped promote the return to study vitamin C as a potential treatment. However, we may be faced with something far more threatening. The history of antibiotic abuse is not reassuring. It may be possible to generate more virulent forms despite Vilcheze’s confirmation that resistance to vitamin C is exceptionally difficult to induce. The use of drugs with a similar mechanism to vitamin C may lead to resistance to our basic biological defence mechanisms. In other words, corporate misuse of this latest development could return us to the dark days of uncontrolled infections when TB was killing 1 in 4 people in the developed nations. Much of the recent freedom from deadly infectious disease reflects historical improvements in nutrition. Over time the mechanisms by which nutrients help people be more resistant to infections are being elucidated. Increased levels of vitamin D may have provided a lower risk of TB and other infections as well as the deficiency disease rickets. It now appears that vitamin C is “extraordinarily” effective in killing the TB microorganism. Importantly vitamin C kills TB in essentially the same way as it destroys cancer cells. Linus Pauling, Robert Cathcart and others may have been prescient in suggesting vitamin C provides a unique way of maintaining good health. 6. Mörner K.A.H. (2005) Nobel Prize in Physiology or Medicine 1905, Presentation Speech, http://www.nobelprize.org/nobel_prizes/medicine/laureates/1905/press.html. This page contains a single entry by Archimede published on July 22, 2015 5:06 PM. If Vaccines Don’t Cause Brain Damage, Why Is GlaxoSmithKline Paying Out $63 Million to Vaccine Victims? was the previous entry in this blog. Industrial Extracts and Derivatives are NOT the same as Natural Herbal Stevia is the next entry in this blog.